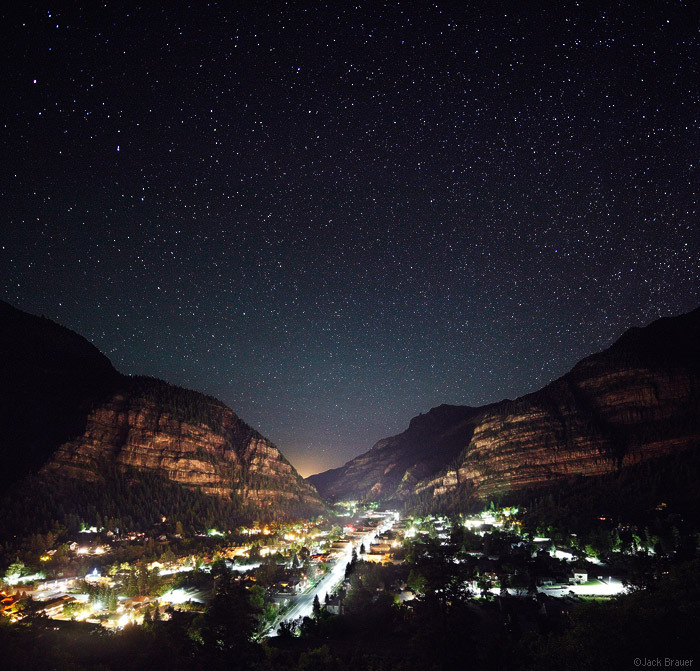 Starry new-moon night over the town of Ouray, in southwest Colorado - June. Taken last night at about 1:30am. So, today I posted this photo on Google+, and another photographer pointed out something cool that I totally missed – that there is actually a faint aurora visible in the image! Apparently there have been a couple strong solar wind streams the last few days, causing auroras at lower-than-usual latitudes. The high-ISO exposure here reveals an aurora that was undetectable to the naked eye, but noticeable in the photo as faint green bands of color in the sky above the cliffs. Certainly not a polar-worthy display, but pretty cool nonetheless! Posted in Colorado and tagged Colorado, Ouray, San Juans on June 20, 2012 May 19, 2013 by Jack Brauer. ← Previous: "Redcliff and Precipice Peak"
Catching the aurora… interesting. The glow from Montrose/Grand Junction also interesting. Questions – is there that much traffic in Ouray on a June night – I know its busy having spent many weeks there – but wow on the longer exposure. And what lens were you using – feels particularly wide but was it cropped? Oh, and how often are you at the gallery. I have briefly stopped the past few times I’ve been through town. Thanks Karl! That’s actually not traffic in the photo – it’s just the street lights that have become overexposed during this long, high-ISO exposure. The town lights were not nearly so bright in person, it’s just that the exposure exaggerates every little light source… which is kind of cool, since it makes the town look a lot more happenin’ than it actually is at 1:30am! I shot this with a 17mm tilt/shift lens, and it’s actually a shift-pano – two horizontal shots, one with the lens shifted down, and one shifted up. I’m not usually at the Skol Gallery, but I do have 4 new big prints in there, so definitely check it out next time you’re around! I love my Zeiss 21; but I really got to get into tilt/shift photography. Too many cool approaches! Once again, Awesome shot Jack! Wow, that’s gorgeous! Was that taken from the pull-off overlook on 550? The reflection of the Ouray lights on the canyon walls is really nice. Thanks Chris! Yes, that’s just from the side of the road near the “Switzerland of America” turnout on 550 right out of town. Thanks Michelle! 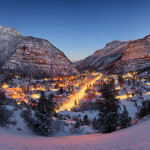 You won’t regret it… Ouray is awesome! Especially in July. Stunning!!! How long was the shutter speed? The glow on the horizon line, could that be the lights of Silverton? Which now makes me wonder, where’s Mt Abrams? Must not be visible from where the photo was taken. Anyway, it a gorgeous photo. Thanks Mark! That was a 30 sec. exposure @ ISO 3200. Btw, I am enjoying your blog! Oh, I get it… duh. Shot looking north toward montrose. Your blog is truly an inspiration! All of your pictures are amazing and each one has a different story to tell. I love the detail and quality, and now I want to visit Colorado!